Today I planted (launched?) the second wave of Rocket ‘Skyrocket’ into my windowbox. The first batch had germinated within three days – but these have been planted in warmer temperatures and also in a slightly different compost – so we’ll see how these fare. I found the last batch had the peppery taste, but the leaves were far from being as big as the ones on the seed packet or as big as the ones that you’d get if you bought one of those (overpriced) bags of rocket from your local supermarket. I’m a serial buyer of bagged Rocket because I generally eat salad leaves every day, but I found that the previous wave of Rocket just wasn’t producing enough and was spending a lot of time just sending up flower buds that seemed to appear every other day. Maybe the differences with this second round will help to achieve a better crop. Speaking of crop, this week I expect to pluck the very first Courgette ‘Black Beauty’ from my two plants. They are both producing them but the plant at the sunnier end of the garden has been a bigger plant, and ahead of the one in the slightly shadier part of the garden (close to where last year’s one had been). This year of course, I’m also feeding them with the Doff Portland Tomato Feed, so this might attribute to the slight boost as well. I’ve also collected seeds from the Campanula ‘Persicifolia’ which show up every year. It’s now finished and so where there were once beautiful spires of white or blue flowers, they are now covered in little brown pods ready to guarantee next year’s blooms. The bees come into the garden – loving the Digitalis ‘Primrose Carousel’ (the Foxglove) and in particular the blueness of the Lavender. 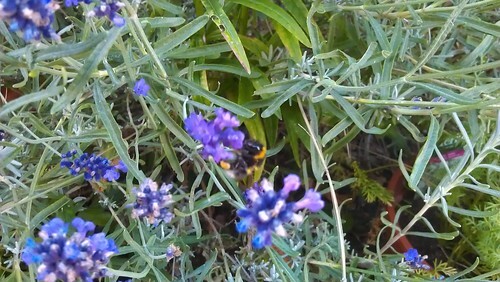 I’ve struggled repeatedly to catch a photo of a bee on any of the flowers in my garden – either because the bee is moving too fast, or the wind is frantically flinging the plants around… but it looks like i might have caught one at last. No prizes for spotting the bee. This weekend’s duties include planting out the Aubergine ‘Black Beauty’ plants with supportive canes (one of them seems a bit wobbly) in one of those wicker boxes (which i’ll need to buy), plus fill in any gaps in the borders with plants.